I’ve been thinking a lot lately about growth. We all grow in so many ways, that we often don’t even acknowledge. You are doing things today, you once thought were impossible, no matter how big or how small. Maybe you always dreamed of getting your college degree, but the journey to accomplishing that goal was so difficult that it seemed unrealistic, but here you are gearing up to walk across the stage. Maybe you thought you would never be able to approach that person, or go to a certain store, or tackle a fear, and yet here you are, doing the very thing that scares you. For me, I never thought I would be sharing my story to help others, but here I am doing it, and feeling really proud of myself because of it. A lot of times we forget to stop and pause and be thankful for our growth. We forget to do the necessary reflection so we can be proud of ourselves for the growth we have experienced. I think a lot of this is due to the fact that we go through our lives looking for instant gratification. We think about our dreams and how amazing they would be if they turned out to be exactly how we want them to be, but when we realize those dreams will take time to accomplish, we get discouraged and disheartened. We don’t congratulate ourselves for even having that idea, and we often don’t feel good about the small win we accomplished. While we might never fully get our instant gratification mindsets to go away, we can be realistic with ourselves about our goals and we can congratulate our growth. When we can do that, we can be grateful for the journey, even if it is slow. I am grateful for my growth in learning to love my body after struggling for years with disordered eating, but I will admit it can be frustrating to want to love my body all the time but still have really bad body image days. I want that instant gratification of reaching my goal of saying – “Yes! I am recovered, my body is amazing and I will never think otherwise”. I am not sure I will ever get to that point, but on my journey of striving for that goal, I can pause and be grateful that I now have more good days than bad days, and that I can point out things I love about my body more times than not. That is growth. No matter how slow the growth is, there is growth, and the growth is beautiful. I am sure you have a similar experience. So instead of getting frustrated with yourself for falling short or not reaching your goal as quickly as you wanted to, stop and pause and be proud of yourself for doing more than you were doing yesterday. Be thankful for the growth you have made with every step. Even when we fall down and we go back a few steps, we already have such a strong foundation under us that will allow us to keep moving forward in the direction of our goals, with gratitude of ourselves at the forefront of our minds. All of your experiences to this date, have allowed you to grow into the very person you are today. We all still have a long way to go, and we will never be perfect, which is not the goal anyway, but we are stronger today in this moment than we ever have been before. Even if in this moment, we feel weak or we feel discouraged, we have done so much up until this point, and we have everything within us already to get through this difficult time. 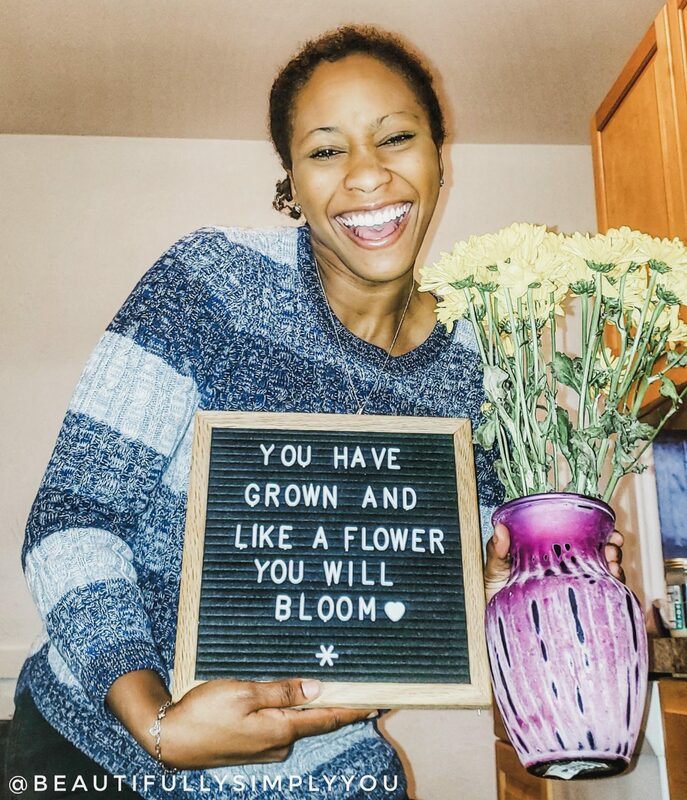 You have grown, and just like a flower you will bloom. You will use your experiences of the past, no matter how sad, traumatic, or hurtful they might have been, to propel you forward. It can be so helpful to pause in your pursuit of happiness, success, or love, and just be grateful that you are who you are, and that you have been where you have been. Because without those experiences, you wouldn’t be here today, strong in your foundation, ready to take the world by storm, knowing that no matter how long the journey is to your goal, your strength will grow, and that growth, is just simply beautiful.